Our main focus was to provide medical treatment, medicine, water, sanitation etc for the displaced Rohingyas of Myanmar. All the doctors from Bangladesh Medical College were volunteering lead by a dedicated person Dr. Naheed. Fatema. Besides medical effort BUET volunteers are distributing clothes and other critical supply to the vulnerable mothers. Bangladesh Medical College medical team: Total participated doctor-5. Specialist doctor-3, Medicine, surgeon, gynecologist Junior doctor-2. Additional volunteers-7 people as language translator, medicine distribution, helping patient to understand prescription. Total patient served: approximately 600. Date -30.09.2017 Place -Balukali Rohinga camp, Ukhia. 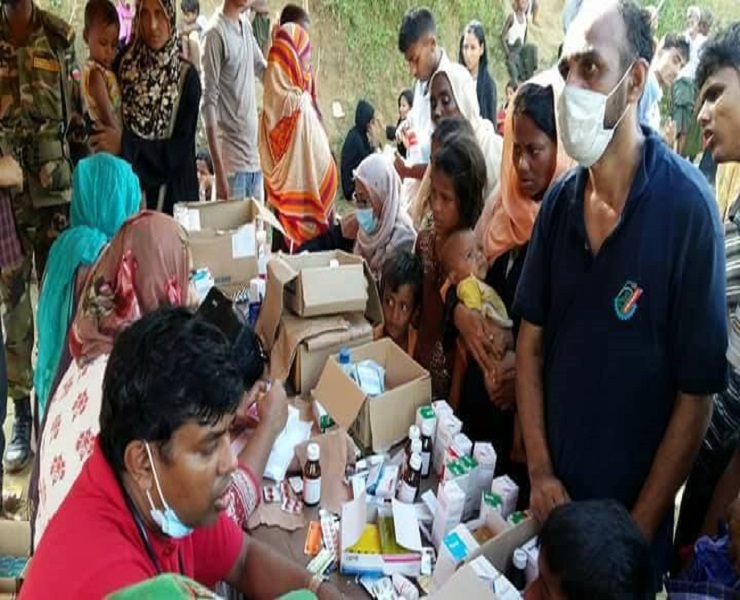 Services provided: diagnosis of disease, prescribing and distributing proper medication, health education for sanitation, counseling and support to comfort the inhuman circumstances the patients had faced which forced them them to take refuge in Bangladesh. Service Population: predominantly young children and women Main health problem identified: Most of the young children are suffering from pneumonia( Upper respiratory infection), Most of the women are suffering from Urinary Tract Infection (UTI) and grniatal infection. Almost all of them are suffering from diarrhea, severe skin disease, cough, common cold, physical and emotional distress due to inhuman and brutal abuse.